St. James has been known as the mother church of the parish consisting of Christ Church, Haysville (no longer in existence), St. George’s, and St. James Church and Cemetery. 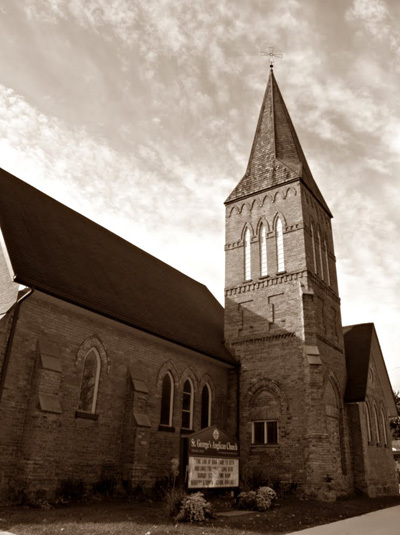 In 1842 the original congregation of St. James met in a building across the road from the present location of the church. This building was used for both church and school. In 1854 the nave of the current church was built on three acres of land formerly deeded by the Canada Land Company. Samuel Mark, an early member and supporter of St. James, bequeathed $400 toward the purchase of a bell for the church, provided the congregation built a tower. This tower was built at a cost of $850. On Ascension Day in 1897 a team of horses raised the 3000 pound bronze bell to its home in the belfry. The inscription on the bell reads “Gloria in Excelsis Deo”. 115 years later we are still delighted by the wonderful sound of this bell. In 1931 weekly services were discontinued and St. James was designated a funeral chapel. In 1952 extensive renovations were completed in observation of the centenary of the Wilmot Parish. In 1985 a new board was formed under the direction of Rev. Roy Shepherd, minister of St George’s. An expansion of the cemetery took place in 1993. The church has beautiful original stained glass windows that were restored between 2006 and 2010. We continue to use the original pump organ that has been converted to a blower system. The bell contained in the tower has a beautiful sound and we encourage people to ring it when they attend services at the church. We invite you to attend our annual Anniversary Service held in this historical chapel on the second Sunday in June or the Harvest Festival held the week before Thanksgiving. Please join us for worship and fellowship and a chance to hear the beautiful tones of the St. James bell as it rings out across the countryside. 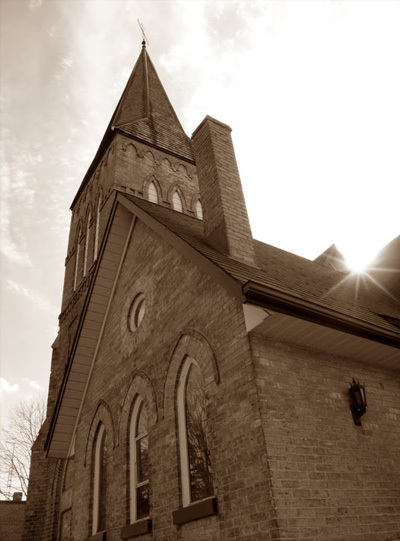 Click here to read an article about St. James Chapel as featured in The New Hamburg Independent Newspaper. St. James Chapel is located at 4339 Huron Rd. in New Hamburg, just south of Highway 7/8. For additional information about St. James Chapel and Cemetery, please contact sgac@stgeorgesnewhamburg.com.